The Easiest DIY Sandbox - C.R.A.F.T. Note: This post is sponsored by Discount Tire, as always, all opinions are my own. First, determine how big of a circle you need for the base of your sandbox by measuring the tire’s diameter. Then, draw the right size circle onto your wood and cut it out with the saw. 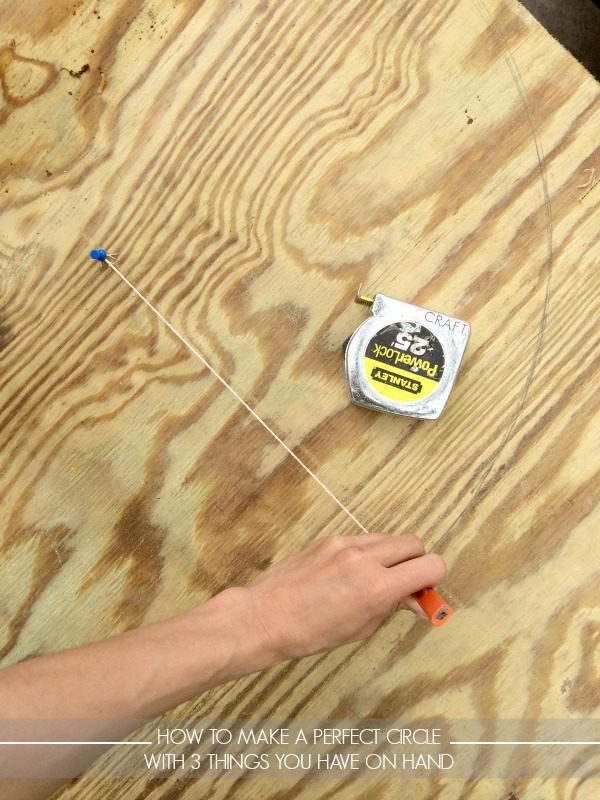 The DIY compass is super simple. Just measure a piece of string 2 inches longer than you actually need it and tie one end to the thumbtack and one end to the pencil. Voila. 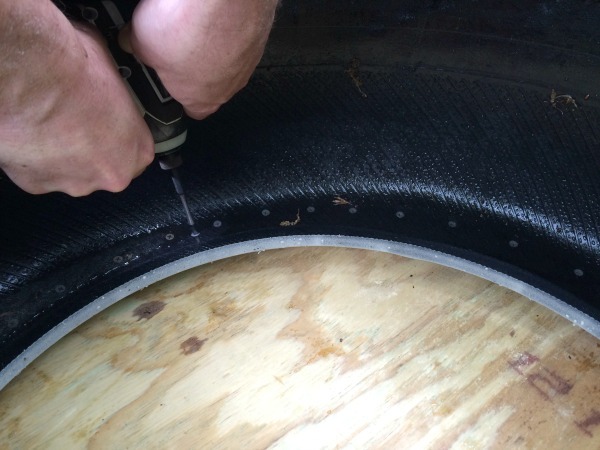 After you circle is cut, you will need to sand the edges down to make it smooth. Oh and make sure your circle fits on the bottom nicely! After the bottom is cut out, you will need to do the same thing for the top of the sandbox. You can skip this step if your sandbox is under cover. But, we have a lot of stray cats that hang out in our backyard so we are attempting to avoid our sandbox turning into a litter box. 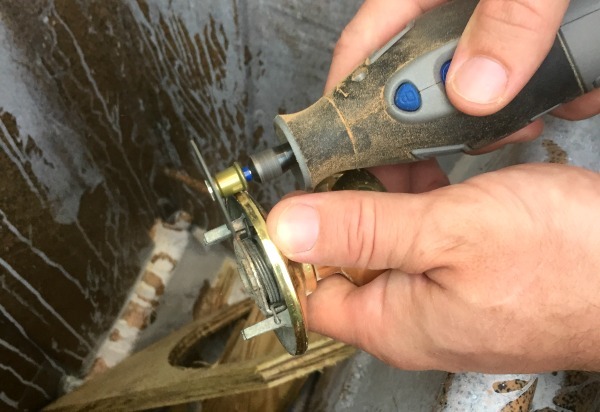 Andy used the Dremel to cut the 2 long prongs off of the door knob so that he could attach it to the top of the sandbox. 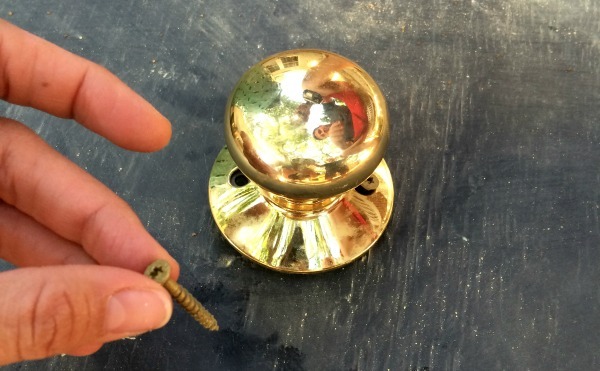 After you sand and paint the top of your sandbox with chalkboard paint, just screw in the door knob! Check out this post if you need deets about painting and conditioning chalkboard paint. 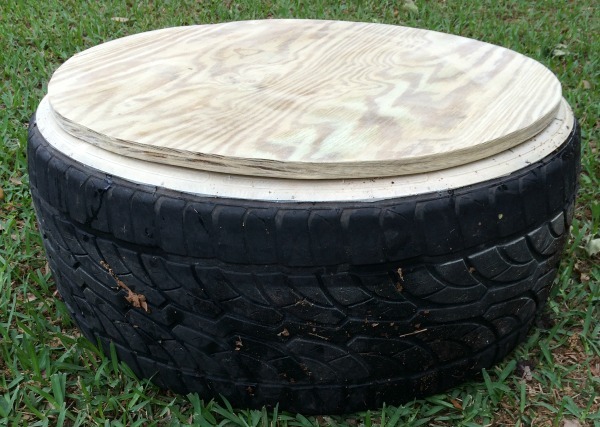 If you’re looking for more ways to up-cycle a tire, here are 22 more awesome ideas! This is such a great idea! Thanks for posting. Hello from Tutorials & Tips Link Party. I see old tires all the time. This is a great idea for my Preschool! This is SO cute, Jamie! This is tooooo cute! Thanks for sharing! Great idea! So creative! Thanks for sharing at Thursday Favorite Things. I hope you will join us again this Thursday! Fantastic! Heck, you could make an entirely tire-themed playground with tire swings, etc. Appreciate you bringing these to our Snickerdoodle Sunday link party and I hope you come back this weekend! Hi Jamie! Great idea! (And I love how you used your chalkboard to title your project instead of a graphic!) Thanks for linking up at The Handmade Hangout! 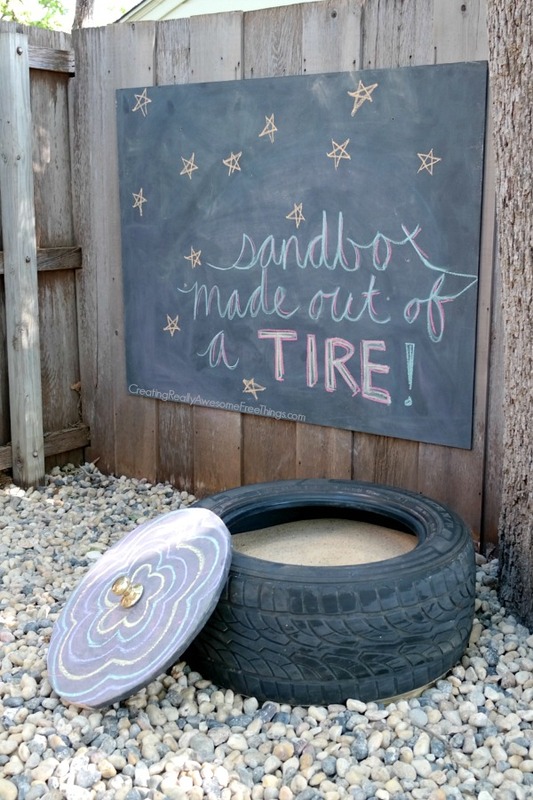 What a cute sandbox idea! So creative! I love this idea. I think my kiddies are a little big now, maybe a tractor tire for them, haha. Thanks for linking up to Snickerdoodle Sunday! This is so cute! Great idea. 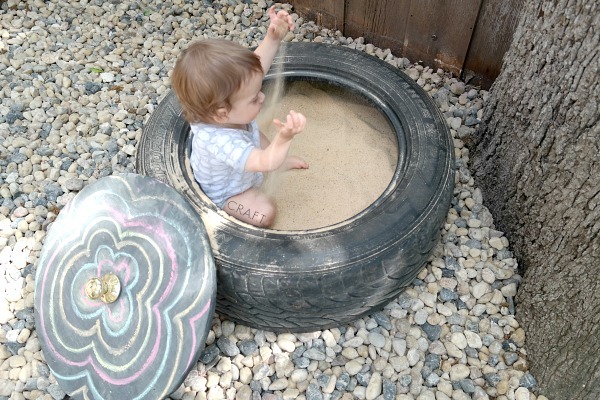 This might just be the cutest sandbox ever! What a great way to upcycle a tire. I love this post! This is such a creative post and great use of cardboard materials! Thank you for linking up on “A Little Bird Told Me” Wednesday link up party! You have been featured on Mama’s Happy Hive blog. Oops! I meant to say a great use of recycled materials! 🙂 This is a wonderful way to use an old tire. This is such a cool idea! I love it. Thank you for sharing this at the #SmallVictoriesSundayLinkup! This is a GREAT idea! Thanks for sharing at the frugal crafty home linkup! This is such a cool idea! Thanks for sharing with us at Mommy Monday!! Thanks for sharing at the Inspiration Spotlight party! Pinned, shared. Hope to see you again soon. Great project for this summer for the kids. Thanks for the tutorial. No yard? I remember my mom filled a huge (but kinda shallow) plastic tub with mixed, uncooked BEANS! We LOVED it! Sorting, filling, pouring, sifting, running threw our fingers… THANK YOU for bringing those good memories back!